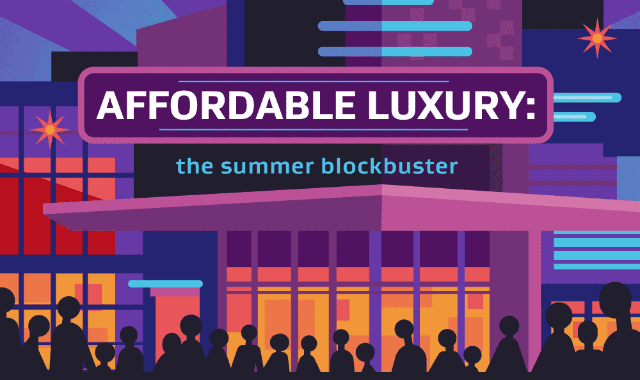 Summer Blockbuster: Affordable Luxury #Infographic ~ Visualistan '+g+"
Though the number of movie theaters in the United States is falling, movie lovers have nothing to fear. Millennials continue to frequent movie theaters despite also using Netflix and other streaming service and the number of screens is actually increasing. Modern movie theaters are far more luxurious than their predecessors. From adjustable, reclining seats and full-service bars, to theaters with dine-in auditoriums complete with waitstaff and a full restaurant menu, theaters are adding amenities that make the experience worthy of rising ticket prices. With 64 speaker surround sound, digital projection and 3D, seeing a film in theaters is a far more immersive experience than home viewing. In fact, a family of four can go to the movies every month for a year and spend much less the cost of installing similar equipment at home.